About 15 years ago, the Michigan Stained Glass Census learned of what was thought to be an unusual stained glass window. 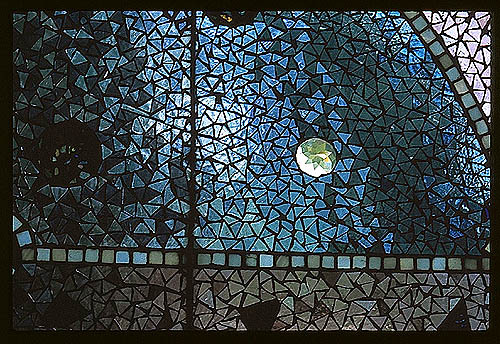 Located in a private home near Lansing, MI, this window looked like a mosaic, as it was made of hundreds of triangular pieces of glass, gradually flowing from one color into another. The homeowner stated that several antique dealers thought it to be a Tiffany window. However, the MSGC felt that not to be the case, but was not sure of the method of fabrication. At that time Richard Hoover was the editor of Stained Glass Quarterly; he was sent a photo and asked his opinion. In return, Rick said that sitting on his desk for several months were photos from a similarly styled window from the 1890 House Museum in Cortland, NY. When the window at the museum literally fell out, on the lead border was a small plate--Belcher Mosaic Glass Company. With these clues, Barbara Krueger did extensive research and eventually an article was published in the 1994 spring issue of Stained Glass Quarterly. The following is a synopsis of that article. Even though the Belcher Glass Company was listed as early as 1825 in a Newark, NJ city directory, it was in 1884 that Henry Belcher (grandson of the early owner) obtained a patent for the mosaic process that, in his words "will reduce the cost of producing stained glass, secure a more perfect finish, gain greater firmness or rigidity in the finished product and facilitate the manufacture thereof." By 1886 the Belcher firm produced a hand-colored sales catalogue of designs which the Cortland Old House Museum personnel were able to locate at Winterthur Museum in Wintherthur, DE. The designs fell into several categories: those with a floral theme; those for use in a transom with a house number; those with neoclassic elements popular in the late 19th century; and several pictorial scenes (fish swimming, flying bats and several with the human figure). However, in the designs with a human figure, the figure executed in large pieces of opalescent glass in lead came, with mosaic glass as the background. Due to the complexity of the designs, it is possible the mosaic process had been utilized for several years prior to 1884 when the patent was applied for. The actual fabrication process consisted of the small triangular glass pieces laid on a pattern, which was then covered with a sheet of gummed, or adhesive covered asbestos. The asbestos sheet was turned over and a second sheet of gummed asbestos was placed on top of the first, as to form a "sandwich." A framework was placed around the outside edge of the "sandwich" and then all was tilted up at a 60-degree angle. Molten metal was poured between the edges of the asbestos sheets and it would run down into the passages between the pieces of glass, holding them together. Several other patents for the mosaic process indicated (1) the addition of strips of brass between the pieces of glass (for a support system); and (2) placing the asbestos on a heated "back plate," raising the temperature of the glass to eliminate thermal shock. The materials and method of construction have been widely conjectured. 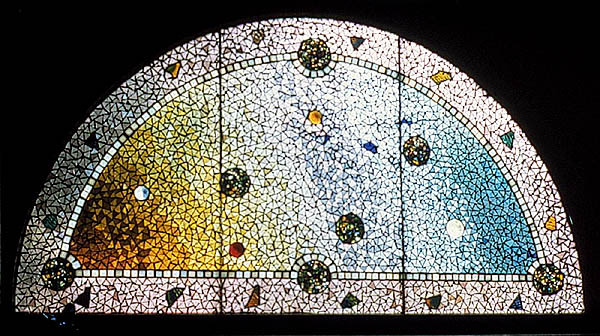 In 1986, H. Weber Wilson referred to the windows as "mercury mosaic" in his book Great Glass in American Architecture. While doing research for the 1994 article, several sources that had a mosaic window in their possession offered to test the metal matrix. Four independent metallurgical tests were conducted: Galveston, TX; Detroit, MI; Boston, MA; and Front Royal, VA. None of the readings were identical but all found the matrix to be a combination of lead, tin, antimony, copper, bismuth and trace elements. Essentially the matrix was solder, ranging from 65/28 ratio of lead to tin to 50/45, with 3-5% antimony and less than one percent bismuth and copper, along with dirt and oxidation. No mercury was present in any of the tests. So although Mr. Wilson stated in his book, "workers became contaminated and production was shut down," most likely it was lead poisoning that affected the workers, not mercury poisoning. Gordon Henderson, a third-generation stained glass worker from New Jersey, remembers as a young boy sitting with his father when talking to the original workers from the Belcher Mosaic Company. The Gordon Henderson Collection of American Stained Glass Design has been donated to the Zimmerli Art Museum at Rutgers University, New Brunswick, NJ, and a panel illustrated on the Rutgers website was used on the cover of the 1994 article. Repair of the mosaic style windows has been refined by trial and error by several American studios. The general consensus is to place the window in a sunny location and let the heat of the sun gradually flatten the panels, with some very careful assistance from judiciously placed weights. If glass has fallen out, replacement glass is inserted by the copper foil method but a gas-fired soldering iron is preferred because it can be regulated to a lower temperature than can an electric iron. The addition of support rods is highly advisable to prevent further deflection. According to Gordon Henderson, the Belcher Mosaic Glass Company went out of business because the style no longer appealed to the buying public and because of the difficulty in repairing the windows. While doing research for the article, Belcher mosaic windows were also found in-situ in GA; IL; LA, MA; NH; NJ; NY; PA; SC; TX; VA; WI--private homes, bed and breakfasts, several churches and one state capitol. Many windows are also in the hands of antique dealers, having been removed from private homes. After closing down the Belcher Mosaic Glass Company, Mr. Belcher moved to the Chicago area where he became involved with the Luxfer Prism Company, the manufacturer of pressed glass tiles used in store fronts. Some of the partners were clients of Frank Lloyd Wright and eventually several Wright-designed patterns were used in Luxfer prisms. Those who assisted with the original 1994 project were The Old House Journal, The 1890 Courtland House Museum, Bob Anderson, Bill Cummings, Bill Darwin, Fred Shea, Gordon Henderson, Rick Hoover, Dan Maher, Monona Rossol, Dan Steubing, and Helene Weis. A photo was discovered showing a group of Union Civil War soldiers standing beside a church with Belcher Mosaic Windows. The notation on the photo is simply "Mt. Pleasant," with no other location/state mentioned. This private residence was registered in the Michigan Stained Glass Census by Barbara Krueger of Hartland, MI. Krueger, Barbara. "Belcher Mosaic Stained Glass." Stained Glass Quarterly. Spring 1994, Vol. 89, No. 1, 20-30. Wilson, H. Weber. Great Glass in American Architecture: Decorative Windows and Doors before 1920. (New York: Dutton, 1986). Text by Barbara Krueger, Michigan Stained Glass Census, July , 2005.